What do you look for in an airport terminal? What makes it easy and comfortable for you? Long Beach opens its new terminal this week and the city hopes that their new terminal – a major upgrade from the temporary trailers of the prior iteration – focus on simplicity, accessibility and low costs will make it a big winner in southern California. 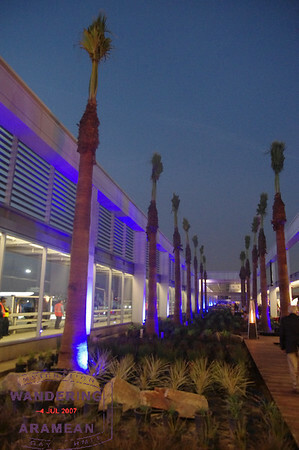 The new terminal borrows from its quintessentially SoCal in its design and amenities. Features like outdoor seating rather than just rows of typical airline benches are just one of the many ways they have given local flavor to the facility. They even put in a fire pit. Similarly, the concessions – both restaurants and shopping – are nearly all local brands. Passengers arriving are welcomed with the Southern California vibe and passengers leaving have that local experience extended a few extra hours. All of the dining concessions are outlets from Long Beach restaurants; no national chains to be found here. Fear not the lack of Wok-n-Roll or Pizza Famiglia. The local shops are quite tasty, at least from the samples being handed out at the ribbon cutting party last week. The 4th Street Vine Bar has a wine steward on staff to help passengers choose a glass of wine to enjoy while waiting for their flight. Or take a meal at McKenna’s, an outpost of the renowned waterfront restaurant. 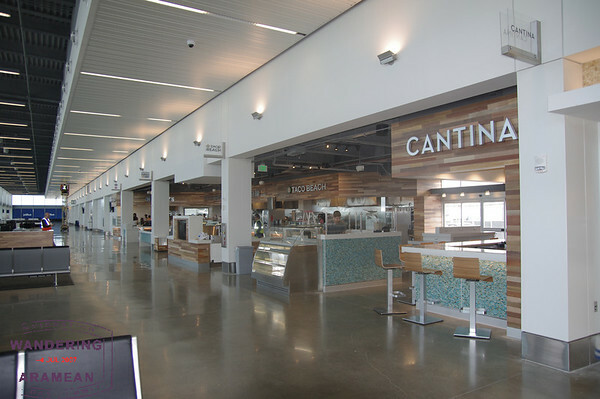 A local sushi bar, cantina, burger joint and bakery (delicious cupcakes) are all available in the terminal, too. The concessions area will feature a number of modern touches. 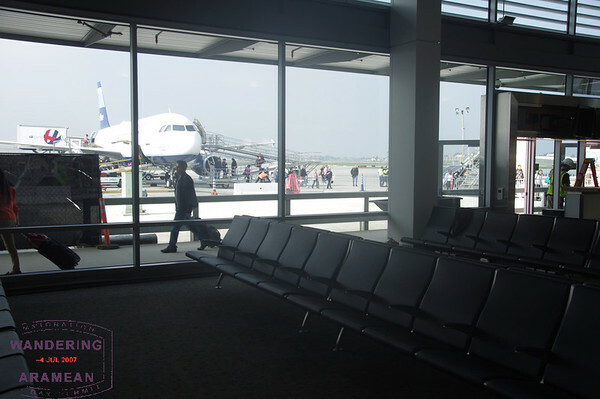 Power outlets in the seating areas are considered a standard feature for new terminals these days and Long Beach has no troubles there. Both regular and USB outlets are scattered throughout the terminal area, including in the dining areas. 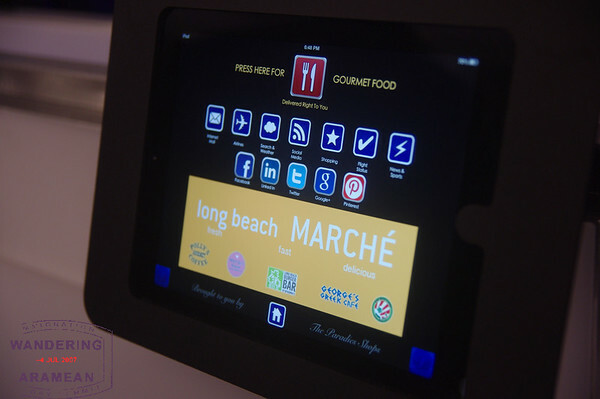 For passengers who do not want to wait in line to order a meal there is also the option to use one of the tablet computers to order a meal delivered to the gate area. Perhaps the most notable thing missing from the new terminal is jet bridges for boarding. With roughly 350 days of sunshine and reasonable temperatures year-round there isn’t all that much need for them. Plus, they’re surprisingly expensive; adding jet bridges in would have nearly doubled the cost of the construction project. It also would have made for a much more complex project and reduced the flexibility the new terminal offers for airlines. Plus, there is something special about walking across the apron area, looking up at the airplane before stepping on board. The new Long Beach terminal is simple yet still manages to deliver an impressive and welcoming facility for passengers. Providing a better experience from the prior terminal isn’t a terrible challenge. Building out one of the most comfortable, welcoming and efficient terminals in the United States is much greater hurdle. Long Beach has cleared that challenge, delivering a beautiful, functional and local operation. n.b. – My costs for visiting the terminal opening were covered by the Long Beach Convention & Visitors Bureau. At least assuming I mail in the receipts they will be. Doesn’t change my take on the terminal. It is incredibly simple and looks great. This is cool. I always fly into LGB (funny acronym) rather than LAX as it’s great to walk off the plane, cross the road and you are at the car rental. Now there will be a good reason to fly back out too. What do you need the lounge for? Quiet, relaxing place to sit? They have that. Free wifi? They have that. Free drinks? I’ll take a decent wine bar over the schlock poured by US/UA/DL. You likely aren’t going to be spending long layovers or extended waits at the airport. I can’t see what value the lounge would add. I do like the OAK to LGB flight… But it has been a couple of years since I was on it. If you are an AA or UA customer then you’re not flying out of LGB anyways; neither has service there. And planning a trip based on if an AA or UA club is available in the departure airport is generally one of the lower priorities on my list. The route map is definitely a potential issue. The airport is slot limited based on noise restrictions and that will only change if they get quieter planes in there. I’m sure JetBlue will bring the NEOs when they become available but that’s several years off yet. Hey did they keep the iconic landside terminal? Yes, they kept the landside terminal. 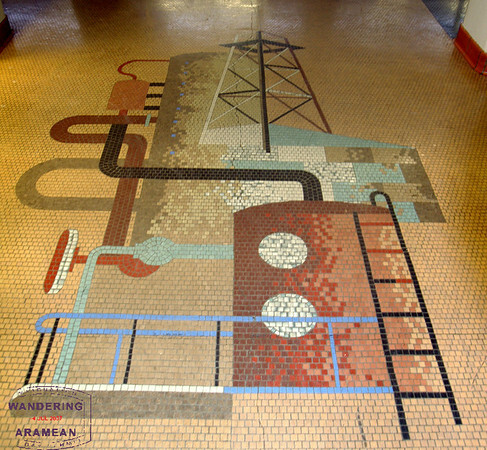 As part of the work they uncovered some 40s-era mosaics which were preserved. It is pretty cool. I love using LGB, it’s extremely convenient for my LA destinations. But then I’m SLC based and it’s usually easier and cheaper for me to use LGB on Delta or JetBlue than it is Delta to anywhere else or Southwest to LAX. Even the portables used up till now were not all that horrible; by using LGB I could arrive at the airport later than I typically would thus giving me less time to spend waiting on a flight. As for the lack of jetways, it’s fantastic. On good days and if the flights are on time they’ll even board/deplane from the front AND rear of the planes, making it even faster. I can’t wait to hit the new terminal. I’d probably get food delivered to the gate area by the restaurants. Anything is better than eating the swill the airlines try to pass off as food. OAK-LGB looks pretty convenient for some upcoming trips I have… Alternative would be SFO-SNA. We’ll see whether I am chasing UA status again next year or not. Long Beach Airport has never competed with SNA or LAX based on amenities. LGB is by far the easiest airport to fly out of in Southern CA. Even with the old trailers, flights were packed. In my humble opinion, airport lounges, these days, are a huge waste of money. They are generally overcrowded and oppressive because airlines over sell memberships. I would rather find an open bank of seats in the main terminal and people watch any day, especially if there is free wifi. The new terminal areas in LGB will just make flying that much more enjoyable for those who have already been flying out of LGB for years. Congratulations to LGB planners for thinking outside of the box. I have been flying out of LGB since the 90’s, and this new terminal is long overdue, but the wait was well worth it. Congratulations. I live in OC, but gave up using SNA once I realized I can get anywhere in the country from LGB. The only remaining sore spots are the baggage claim areas. To make the new terminal complete these really need to be enclosed or at least better covered. It still gets cold and rains here and it is a miserable experience waiting for your bags in the rain. Also, a covered walkway from the new parking garage would also be welcomed. Baggage claim is going to be updated, too, Dave. That’s part of the next phase once they can pull the old mobile homes out of there. Thanks Seth, glad to hear that.